Many Internet Marketers could take a few lessons from bloggers. 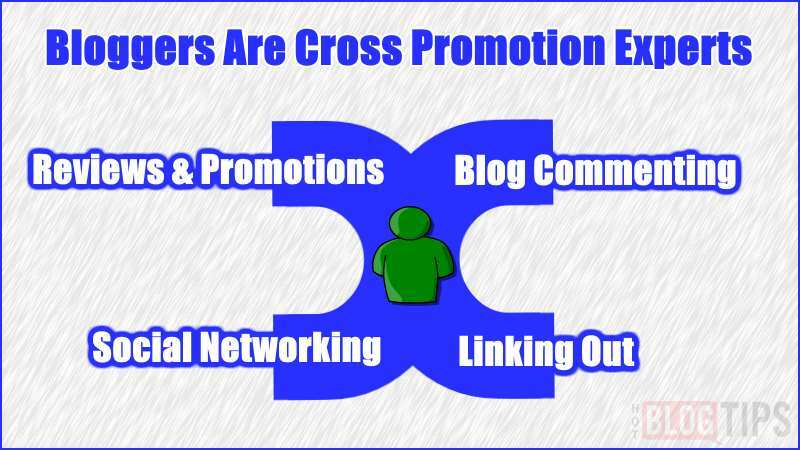 Many bloggers begin cross promoting before they even know what cross promotion is. It’s simply a natural result of the expansive networking bloggers use everyday. By joining forces bloggers are finding it almost second nature to help promote each other, even within the same competitive niche. Many times this is an automatic exchange that isn’t planned or discussed. Getting other blogs to promote your site is a fantastic way to enhance each other’s credibility, increase advertising exposure and boost both blog’s traffic. WordPress plug-ins like Top Commentators, Comment Luv, Who is, and Recent Comments sponsor cross promotion initiated by the other blog. Many bloggers use the Do-Follow plug-in to encourage others to join the process. Another form of cross-promotion bloggers are great at is self cross promotion. The goal of any blog is to keep visitors on our site as long as possible. We want them to comment and then go to other content available from our site. This leads to new relationships and increased exposure to ads. It’s a simple matter to insert a link to a previous post when we’re writing a new one. Plugins that allow us to insert things like related posts and most feedback are very effective ways of increasing site visit times. Bloggers are exposed to self cross promotion tools immediately with archives, categories, tag clouds and sitemaps. All are also designed to direct traffic to other areas of our blogs. Successful blogging creates expert cross promoters and networkers. I’m sure I’ve missed examples of cross promotion, can you think of any? Which work best for you?